Bob Boze Bell's Big Bad Book of Bad Diary Entries: The Babe In The Bowler And John Fusco Rocks! The Babe In The Bowler And John Fusco Rocks! 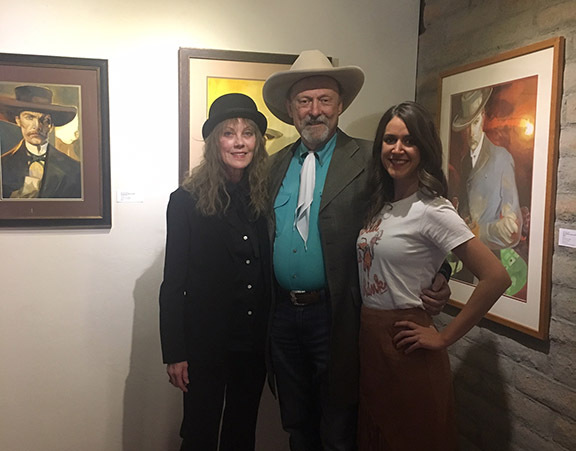 A wonderful time was had by me at our big Cattle Track Doc Holliday Art Show last night in Scottsdale. Here are two of the people who helped me stay vertical: my curator Kristi Jacobs (The Babe In The Bowler) and Stacy Lorton. At the event I presented John Fusco with the True Westerner Award for 2019. John gave a heartfelt acceptance speech where he praised the true history of the West and his long-held appreciation for our efforts at True West magazine. It was quite touching and numerous people told me afterwards how impressed they were with Fusco's comments. "Let me tell you 'bout my baby, you know she comes around. She stands about five foot four, from her head to the ground." A New Doc Holliday In The Works?